We know that block/pavers/Flyash brick precast plants are unlike any other plant and we make them accordingly with concrete product plants in operation we are delivering customized precast plants that fit any machine. Any capacity all components used in our block and paver`s plants are designed form the stand to be adaptable and multifunctional. Form the design and specifications stages to engineering, manufacturing and installation Benny directly controls each and every step of the project through a modular integrated approach. Batching plant to pan mixer conveyor 600mmx7mtrs with 3H.P motor gear box. Custom designed. Set in any easily accessible location. Available silo form 60ton to 200tons. 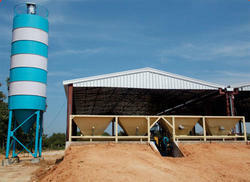 Looking for Batching Plant System ?